This month I am going to begin with the Closed Escrows charts. There is a dramatic change that took place in September in both valleys. 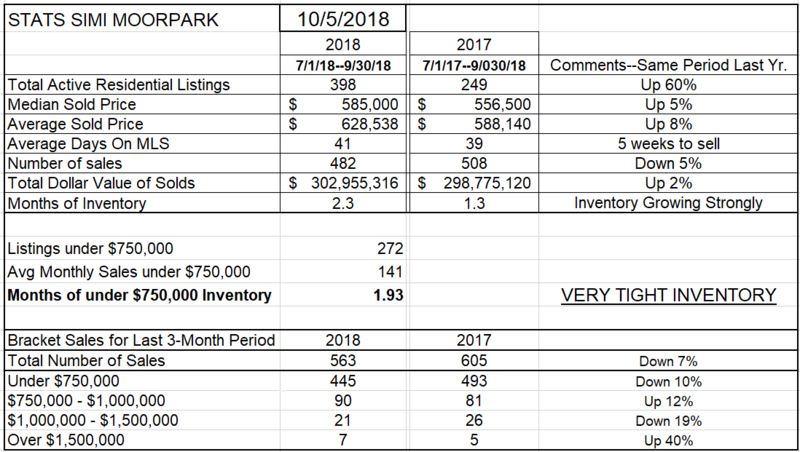 Comparing September 2018 to September 2017, the numbers have declined significantly. For the Conejo Valley, the number dropped from 226 to only 161. For Simi Valley and Moorpark, the number dropped from 193 to 129. I usually like to look at longer time frames of at least three months, but these moves are down 29% and 33%. If that trend continues, the market has slowed down suddenly. As I said, I don’t like to make forecasts on a small amount of information, but this change is dramatic. Next, let’s look at the statistics page for these two valleys and see how the 3-month comparisons have changed. 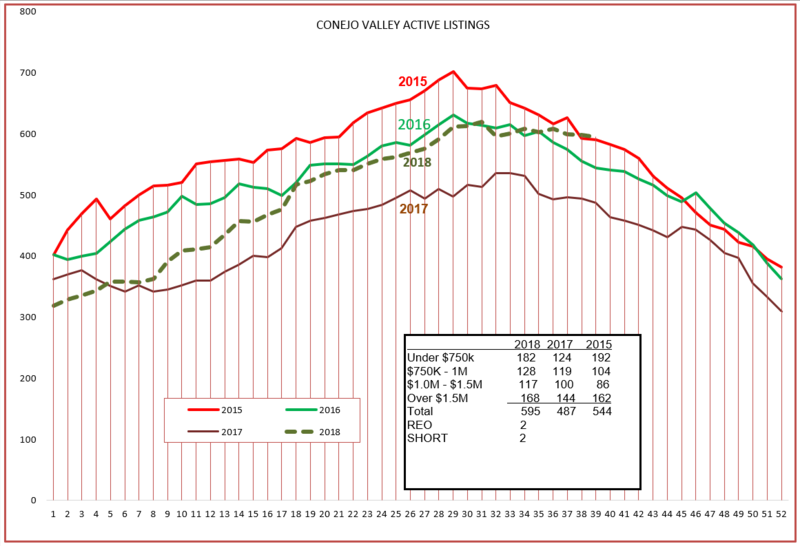 The number of sales for Conejo declined 14% from last year, and sales for Simi Moorpark declined 5%. Now you can understand why the one month numbers above concern me, down 29% and 33%. An anomaly, or portending the future? While the number of sales continues to decline, the number of active listings continues to increase. 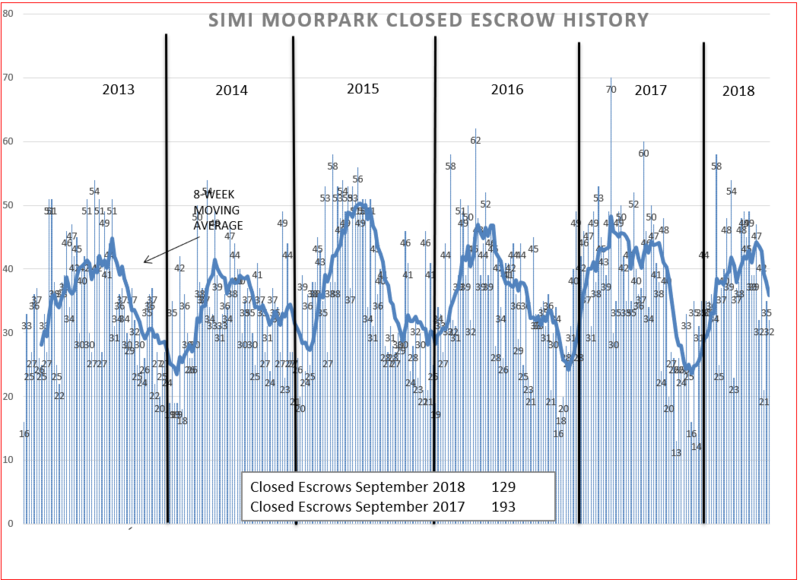 Year to year, for the same three-month periods, the inventory is up by 22% in the Conejo and a whopping 60% in Simi Moorpark. Don’t worry about bubbles. Pricing has not gone wild. 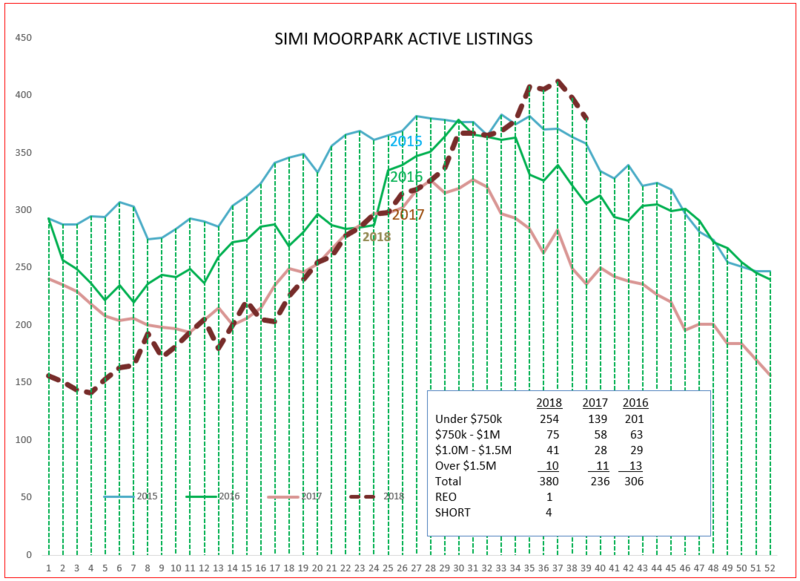 Prices are up only 3-4% in the Conejo Valley, 5-7% in Simi Moorpark. Overall inflation is being reported at 3-4%, so these increases are not out of line. 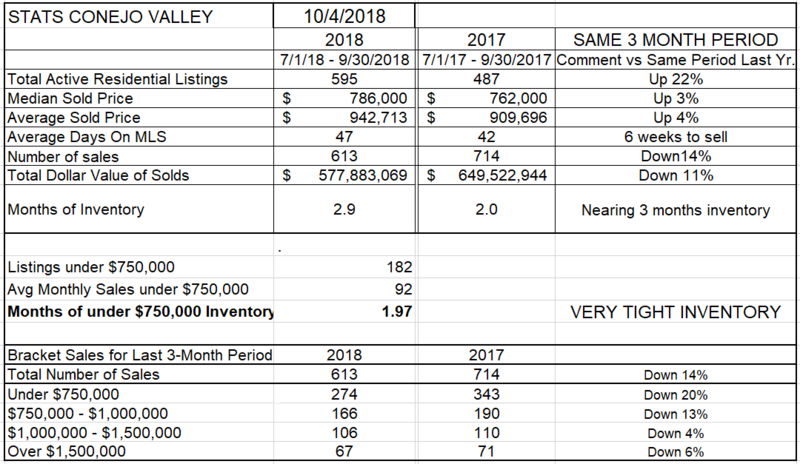 The graph of active inventory listings shows the 22% increase from 2017, and in fact increases from all previous four years. 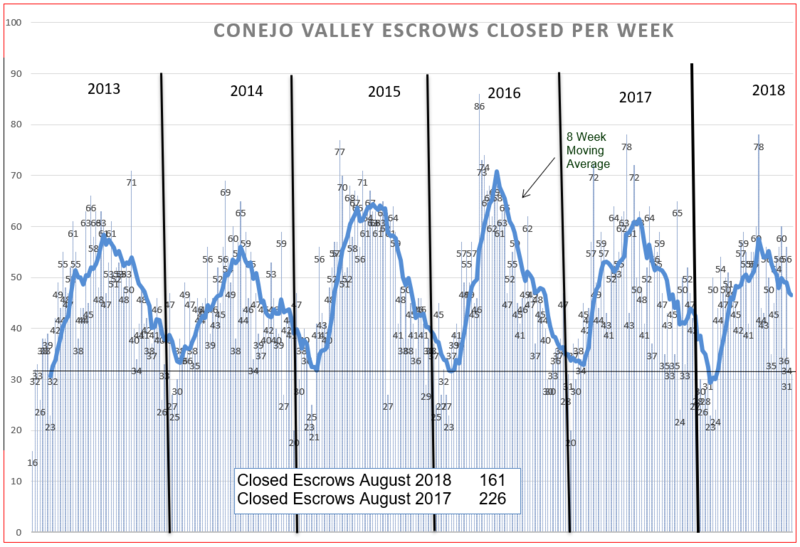 The Conejo inventory is now the highest for this month over the past four years, while the Simi Moorpark inventory, although very high, has finally turned the corner, as expected this time of year. And by the way, both short sales and REOs continue to be minimal. Finally, let’s look at how prices are charting. 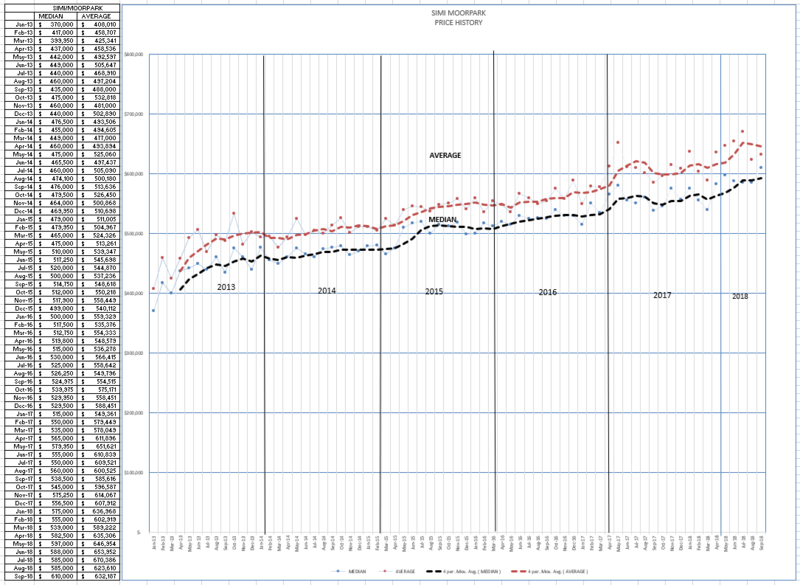 The red and blue dotted lines are averages of the preceding 4 points, smoothing out the series of dots that are harder to interpret. 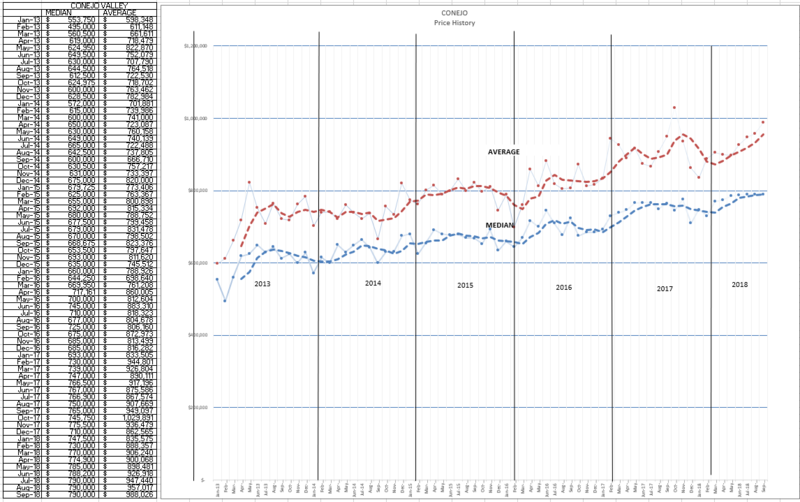 For Conejo, the presence of those red dots above the Average line indicated that the average prices are going up, while the blue Median line is leveling out. Similar things are going on in Simi Moorpark. So what of the future? Charts do not determine prices. Willing sellers and willing buyers determine prices. But the buyers have been outgunned by the sellers for quite some time. The balance of power is definitely shifting. Prices will trend downwards as this correction takes place, and then activity will pick up as more buyers move in to take advantage of better pricing.